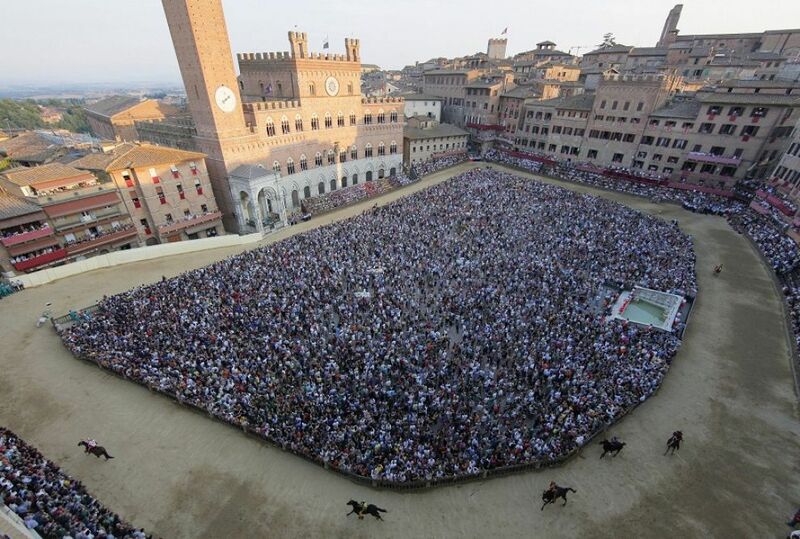 The Palio is the most important event of the year for the city of Siena; Piazza del Campo is transformed and wearing her medieval dresses to accommodate horses and contrada's people. For citizens, it is not just a race, but an event full of mysticism and passion; if you are planning to attend the edition 2016, hurry to book your stay at the holiday home Pieve di San Martino near Siena. The dates are the same every year: July 2 and August 16. However, if you have planned your vacation in Tuscany outside of its Palio period, the apartments with pool Pieve di San Martino near Siena will give you the opportunity to visit the city and the places of the Palio: Piazza del Campo, the most important place of festivity, to understand the history of the race and its development; at least one of the 17 contrade, to know the tipical territory with the Museum, the Company, the stable, the fountain and the Oratory; the Cathedral and the Collegiate Church of Santa Maria di Provenzano. During the weeks of the Palio opportunity to reserve seats, both on stage and in the terrace, to assist from Piazza del Campo directly. Only reservations and availability of the service operator.